This is a simple form of astronomical compendium, with a nocturnal on the outside of the lid, a solar pin gnomon dial and an aspectarium. 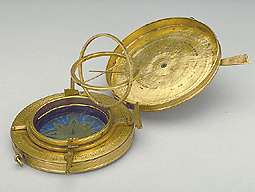 The compass card, finely painted in blue and gold, has the initials of the names of the winds in Italian. The back of the instrument is engraved with a double shadow square, in the manner of an astrolabe, and with a scrolled ring, enclosing three clear and three shaded vertical bands.